The need for emergency repairs in space has been highlighted in 1970 by the famous Apollo 13 mission to the moon where the astronauts had to make a home made carbon dioxide filter using a plastic bag, a flight manual cover and gaffer tape. More recently, Italian astronaut Luca Parmitano nearly drowned in his suit during a space walk where water inexplicably began leaking into his helmet. Such emergencies couldn't be fixed by a phone call to the local hardware store. But now, NASA has commissioned the construction of a 3D printer to be sent to the ISS in the hopes that its presence will help with the general needs of the station along with being a fast way to carry out emergency repairs. Additive manufacturing, also known as 3D printing, is the process by which three-dimensional objects are built up layer by layer through the application of melted polymers. Think of building something out of Lego, adding one layer of bricks at a time. The plastic is built up into the full object ready to be used. The applications are far reaching given the precision and customization available, perfect for the unique components of space flight that aren't always readily available. 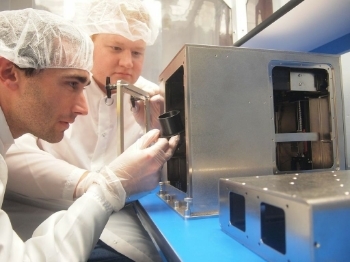 The construction of the printer has been outsourced to California technology start-up, Made in Space, with size limitations around that of a microwave. NASA has outlined that the device has to withstand lift-off vibrations and be a safe addition to the enclosed environment of the space station. The potential of this device has already created a buzz within the community: "Imagine an astronaut needing to make a life-or-death repair on the International Space Station, Rather than hoping that the necessary parts and tools are on the station already, what if the parts could be 3D printed when they needed them?" said Aaron Kemmer, the company's chief executive. The enthusiasm goes beyond an interest in the crew's safety. NASA sees real potential in the technology for the future versatility of the International Space Station. "If you want to be adaptable, you have to be able to design and manufacture on the fly, and that's where 3D printing in space comes in," said Dave Korsmeyer, director of engineering at NASA's Ames Research Center. Skeptics have expressed concerns over the rigidity of printed components, but recently printers have been fitted with laser-melted titanium and nickel-chromium powders to produce much stronger objects. NASA Is also experimenting with the idea of making small 3D printed satellites to be launched from the ISS and send data back down to Earth. Testing is still ongoing and with the prototype recently undergoing flights in the famous Vomit Comet Zero-G simulator, Made in Space is confident it can deliver this exciting new addition to the space station's repertoire on time for launch in 2014.